The nineteenth century was a difficult one of religious crisis and political persecution in which the Order found itself short of freedom to programme its evolution. It began with the Napoleonic invasion and ended with the revolution of the Philippines. Between both dates, disamortizaciones (the sale of church lands by the state) dismantled the Order’s material structure in Spain (1835), and Columbia (1861), and imposed on the entire Order a new spiritual and apostolic profile. The war of Independence (1808-1814) accelerated the decadence initiated during the reigns of Carlos III and Carlos IV. Some convents were razed to the ground, others suffered severe damage, and all stood empty. Some of the Religious enlisted as Chaplains to the Guerrilla forces. Two dozen of these were to know the bitterness of exile, and almost as many died at the hands of the French. The best known of these was Father José de la Consolación - hero of the sieges of Zaragoza. Others fell victim to hunger, pestilence and hardship. When the war had finished, restoration proved to be extremely difficult. The convents were inhabitable and the Congregation lacked the means necessary to repair them; and the Religious, accustomed to freedom, felt incapable of renewing the life in common. The brutal sale of Church lands at Mendizábal (1835) annulled all possibility of reconstruction. In a few short weeks the Order lost 32 of its 33 Spanish convents. Monteagudo was the sole survivor, having been founded several years earlier by the Philippine Province. The Religious -expelled from their convents, and stripped of their habits- found themselves converted into Clerics. Nevertheless, there were those who conserved in their heart the smouldering embers of the Recollection. One of these was Father Gabino Sánchez who, for twenty-nine years, steered the Recollect boat through these tempestuous waters. By his example and his teaching he kept its spirit alive, assured its unity and achieved the restoration of the Colombian Province, reduced to an agonizing state following the decrees of General Mosquera (1861). 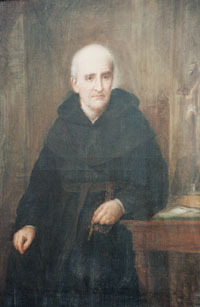 In this task, he counted on the collaboration of the Province of St, Nicholas of Tolentine, which, during the years 1888 and 1898 sent 65 Religious to Colombia.